I know some of you put the brakes on right after the Festive Season, but I like to keep the treats flowing at least until Epiphany. My bunch of taste-testers voted these quite unequivocably the “best cookies ever”. I feel I should qualify this with the word “probably”. If I put out a plate of these, they disappear in seconds and they’re always a welcome gift, particularly during the holiday season. The recipe comes from the Momofuku: Milkbar cookbook by Christina Tosi, from the New York joint of the same name. I have to confess that none of their recipes disappoints. What’s more, the book is full of useful nuggets of information to help you become an even better baker. How good is that? However, just reading the recipes is likely to lead to a furring of your arteries. This recipe is not low in calories and is quite time-consuming (typical British understatement) and so should be saved for celebrating special occasions, such as Christmas, a landmark birthday or winning a grand tour. 1. First make the cornflake crunch. Preheat oven to 140°C/120°C fan/gas mark 1 (275°F/225°F fan). 2. Pour the cornflakes into a medium-sized mixing bowl and crush them with your clean hands to one-quarter of their original size. Add the milk powder, sugar and salt, then stir to mix thoroughly. Add the butter and mix, ensuring all the flakes are coated. The butter will bind the dry ingredients creating small clusters of cereal. 3. Spread the clusters onto a greaseproof (parchment) paper lined sheet pan and bake for 20 minutes, at which point they should look toasted, smell buttery and crunch gently when cooled slightly and chewed. Don’t chew too many or you won’t have enough for the cookies. 4. Cool the cornflake crunch completely before storing or using in the recipe. It will keep in an airtight container in the fridge for a week or a couple of months in the freezer. 5. Now you can make the cookie dough. Combine the butter and sugars in the bowl of a stand mixer fitted with the paddle attachment (or beat with a hand mixer) and cream together on medium-high for 2-3 minutes. Scrape down the sides of the bowl, add the eggs and vanilla, and beat for 7-8 minutes. This is a crucial step – less is most definitely not more. You need to get as much air into the dough as possible otherwise you won’t be able to incorporate all the other ingredients. It should be light, fluffy and have quadrupled in size. 6. Reduce the mixer speed to low and add the sifted flour, baking powder, bicarbonate (baking) soda and salt. Mix just until the dough comes together, no more than a minute. Scrape down the sides of the bowl with a spatula. 7. Still on low speed, gently mix in the cornflake crunch, chocolate chips and mini marshmallows – no more than 30-45 seconds maximum. It’s important you don’t overwork the dough. 8. Use a large ice cream scoop (or ¼ cup measure) to portion out the dough onto a greaseproof (parchment) paper lined sheet pan. Put no more than nine on a sheet, spread well apart. Pat the tops of the cookie dough domes flat. Wrap the sheet pan tightly in clingfilm (plastic wrap) and refrigerate for at least one hour, or even up to a week. 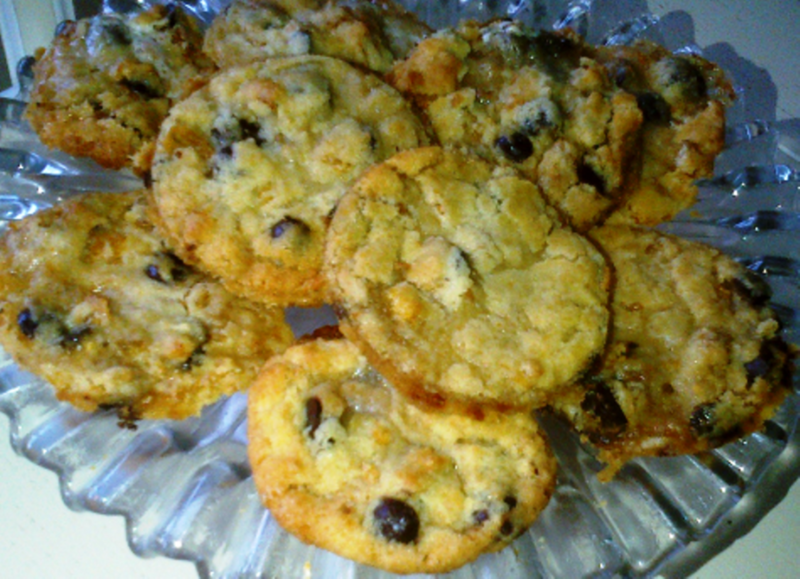 Do NOT bake your cookies from room temperature – they will not hold their shape. At this point, I usually portion the cookies into 4 x 12 portions and freeze three-quarters of the cookies for baking at a later date. 9. When the cookie dough has chilled for at least an hour, heat oven to 190°C/170°C fan/gas mark 5 (375°F/325°F fan). 10. Remove the clingfilm (plastic wrap), place in the oven and bake for 12-15 minutes. The cookies will puff, crackle, and spread. They’re ready when they are browned on the edges and just beginning to brown toward the centre. Leave them in the oven for an additional minute or so if they still look pale and doughy on the surface. 11. Cool the cookies completely on the baking sheets before transferring to a plate or to an airtight container for storage. In theory the cookies will keep for five days, in practice they disappear in nanoseconds. The unbaked dough will keep in the freezer for a month. 2. When I’m baking I always use a timer as it’s so easy to lose track of time. Once you’ve put the cookies in the oven, put the timer on for 2-3 minutes less than they should take to cook and then check regularly. 3. The cookies can be cooked from frozen and I find they only take a few minutes more to cook. 4. 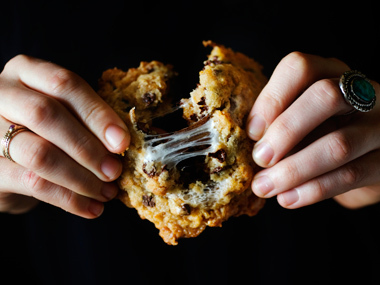 Do not substitute dark chocolate chips for milk chocolate ones as you’ll upset the overall balance of the sweet, salty, bitter cookies. 5. If you can’t find mini marshmallows, cut larger ones into four but roll the pieces in a mix of equal amounts of sifted icing (confectioners) sugar and cornflour so that they don’t stick together. 6. Freeze the unused 1/4 portion cornflake crunch. When you’ve made 3 batches of cookies, you’ll have enough cornflake crunch stored for your fourth!